I have an odd little habit of collecting rocks shaped like hearts. Whenever I see one, I think it is a little sign from God letting me know he loves me. And so, of course, I have to pick it up. 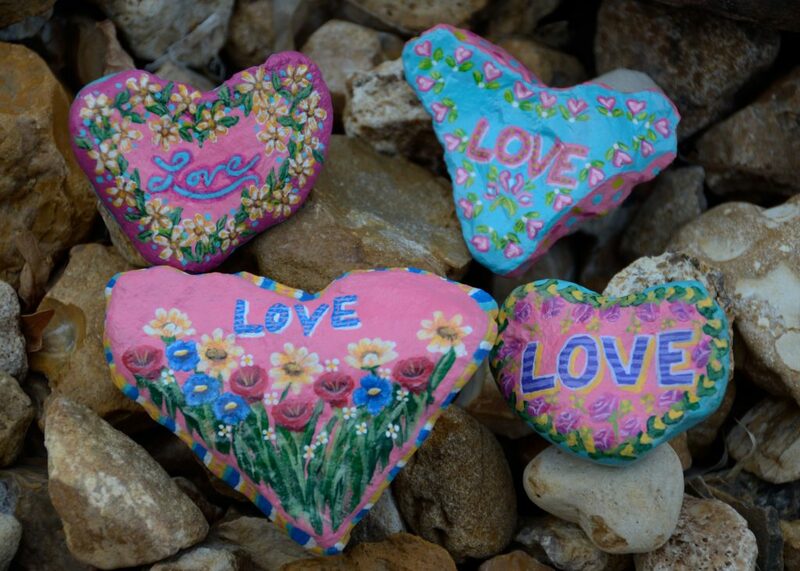 When I die, my children will find little heart rocks hidden in pockets and purses and cubbies all around my house. I’ve got so many, I started painting them and leaving them in parks for other people to find. I guess God knows I need that constant reassurance because, quite frankly, his love is too extraordinary for me to grasp. Sometimes when I’m in church, I imagine what it would be like if a dove flew down from the ceiling and landed on my shoulder. Would I then realize that God’s love is unfettered and extended equally to tax collectors, prostitutes, hapless fishermen and me? Recently, I interviewed Father Anthony Oulette, the archdiocese liaison for Charismatic Renewal, and he said something that struck home for me. He said he wished people could be open to a paradigm change in how we perceive God’s love. “It’s not that we have loved God,” he said. “But that He has loved us. That made me think of Jesus’ great commandment to love God, and love others. There’s a reason one comes before the other. In order to love others, we must first love God — and in order to love God, we must first accept how deeply He loves us. St. John the apostle tells us this. “God is love,” he says.“We loved Him because He first loved us” (Jn 4:15). St. John’s word for God’s love is “agape” — a love that is benevolent and altruistic. In his June 14, 2017 general audience, Pope Francis reiterated John’s message. “God’s first step towards us is that of an anticipated and unconditional love,” he said. “God loves first. I’ve decided my New Year’s resolution will be to try that paradigm change Father Ouellette suggested. Instead of working so hard to love God, I will put my effort toward accepting his immense and unconditional love for me. Every day I will try to be aware of the Holy Spirit on my shoulder, the light of God on my face, and his voice in my heart calling me his beloved. This was the beginning of Jesus’ ministry. Maybe it will be the beginning of something wonderful for me. Once I understand God’s word of love in my heart, perhaps I can be his translator and spread that love to others. And then maybe God will start finding heart-shaped rocks in heaven.